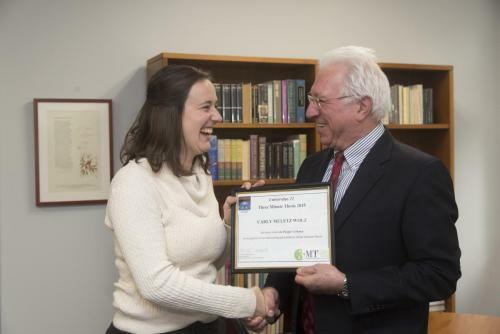 Carly Muletz Wolz, a PhD candidate in biological sciences at the University of Maryland, has won the People’s Choice Award in the 2015 Three Minute Thesis (3MT) competition sponsored by Universitas 21, an international network of research universities. Muletz Wolz and the other competitors were judged on their ability to communicate the significance of their doctoral research to a non-specialist audience in just three minutes. This is the second consecutive year that a UMD doctoral student has won the People’s Choice award in the 3MT contest. Muletz Wolz’s video presentation features her research on beneficial microbes in salamander populations. Her research suggests that salamanders are protected from a fungal pathogen, Bactrachochytrium dendrobatidis (Bd), by their bacterial skin community. This research has direct implications for the conservation of amphibian populations that have been decimated by Bd, and also may provide insight on developing probiotic therapies for other species. Muletz Wolz is advised by Professor Karen Lips in the Department of Biology. The Graduate School conducts an annual 3MT competition for UMD students. The winner of the competition receives a $500 research award and is named as UMD’s nominee to the international U21 competition. Muletz Wolz was one of 20 doctoral students who emerged as finalists from hundreds of students competing in eight countries. The finalists competed for three prizes: Judges’ First Place, Judges' Highly Commended, and People's Choice. As the People’s Choice winner, Muletz Wolz will receive a $300 prize from Universitas 21. In addition to being the university’s 3MT contest winner, Muletz Wolz has received a number of fellowships, including an Environmental Protection Agency (EPA) Science to Achieve Results (STAR) Fellowship, a George M. Wright Climate Change Fellowship from the National Park Service, and a University of Maryland Graduate Research Summer Fellowship. The representative from UMD in the 2014 3MT competition, Amy Marquardt, won both the Judges’ First Place and People’s Choice awards. Amy completed her PhD in material science and engineering earlier this year.